Definition: The Strategic Human Resource Management is concerned with the development of HR strategies intended to direct the employees’ efforts towards the business goals. Scanning the Environment: The process begins with the scanning of the environment, i.e. both the external and internal factors of the organization. The external environment encompasses the political, legal, technological, economic, social and cultural forces that have a great impact on the functioning of the business. The internal factors include the organizational culture, hierarchy, business processes, SWOT analysis, industrial relations, etc. that play a crucial role in performing the business operations. The role of the HR department is to collect all the information about the immediate competitors – their strategies, vision, mission, strengths, and weaknesses. This can be done through the resumes being sent by the candidates working with the other rivalry firm. Through these, HR professionals can identify the workforce, work culture, skills of the staff, compensation levels, reasons for exit and other relevant information about the competing firm. Identify Sources of Competitive Advantage: The next step in the strategic human resource management process is to identify the parameters of competitive advantage that could stem from diverse sources as product quality, price, customer service, brand positioning, delivery, etc. The HR department can help in gaining the competitive advantage by conducting the efficient training programmes designed to enrich the skills of the staff. a) Learning as Socialization: This strategy includes the techniques as training courses, coaching sessions, education programmes to ensure that the employees abide by the rules, value and beliefs of an organization and are able to meet the performance targets. b) Devolved Informal Learning: This strategy helps in making the employees aware of the learning opportunities and the career development. c) Engineering: This strategy focuses on creating and developing communities of practice and social networks within and outside the organization. d) Empowered Informal Learning: Through this strategy, the HR department focuses on developing the learning environment such as knowledge about the new processes, designing of new work areas and the provision of shared spaces. Implementing HR Strategies: Once the strategy has been decided the next step is to put it into the action. The HR strategy can be implemented by considering the HR policies, plans, actions and practices. Monitor and Evaluation: The final step in the strategic human resource management process is to compare the performance of the HR strategy against the pre-established standards. At this stage, certain activities are performed to evaluate the outcomes of the strategic decision: establishing the performance targets and tolerance levels, analyzing the deviations, executing the modifications. 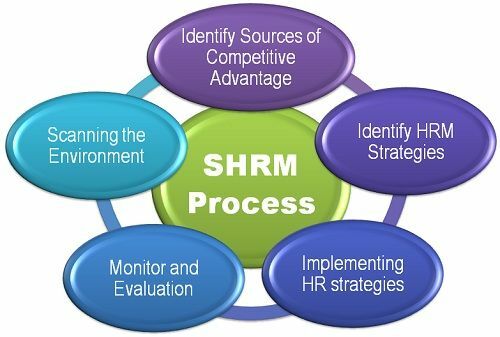 Thus, to have an effective HR strategy the firm follow these steps systematically and ensures that the purpose for which it is designed is fulfilled.